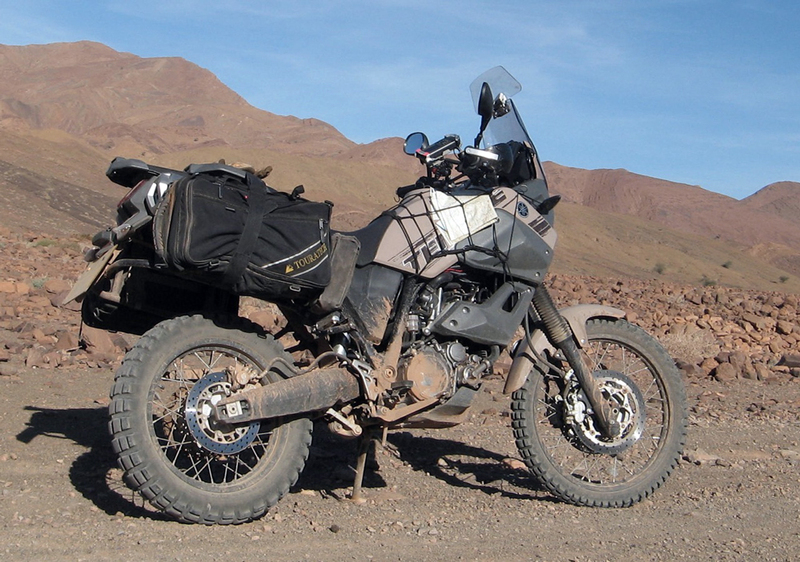 Most of the tyres compared below are what you’d call ‘road-legal knobblies’. 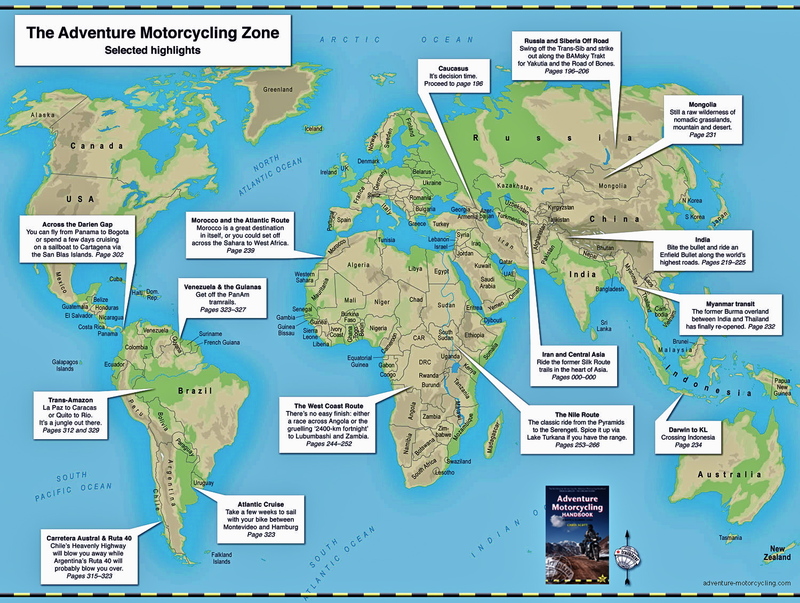 They work fine on dry roads as long as you remember what you’re riding, but some may give you a bit of a fright if you don’t, especially in the wet. 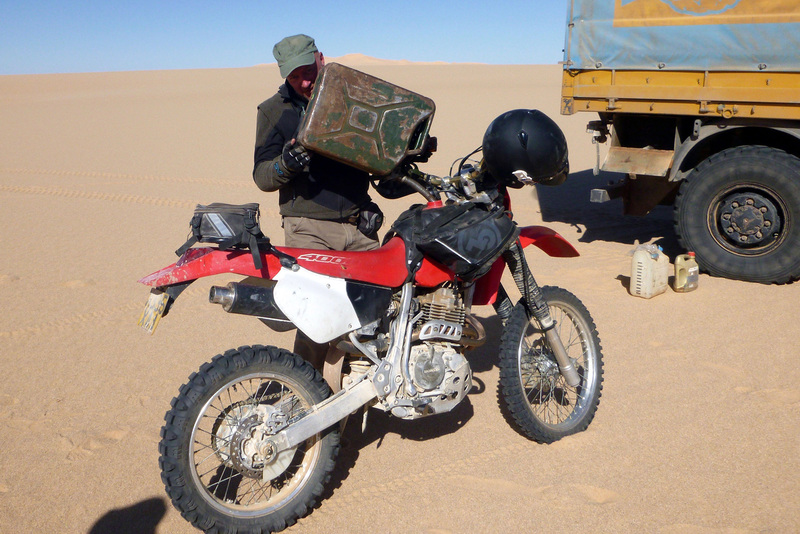 There’s no free lunch: road-legal knobblies wear faster than Road Touring or Do- It-All tyres – the reward is more secure grip on loose surfaces which may be more of a priority on your trip. 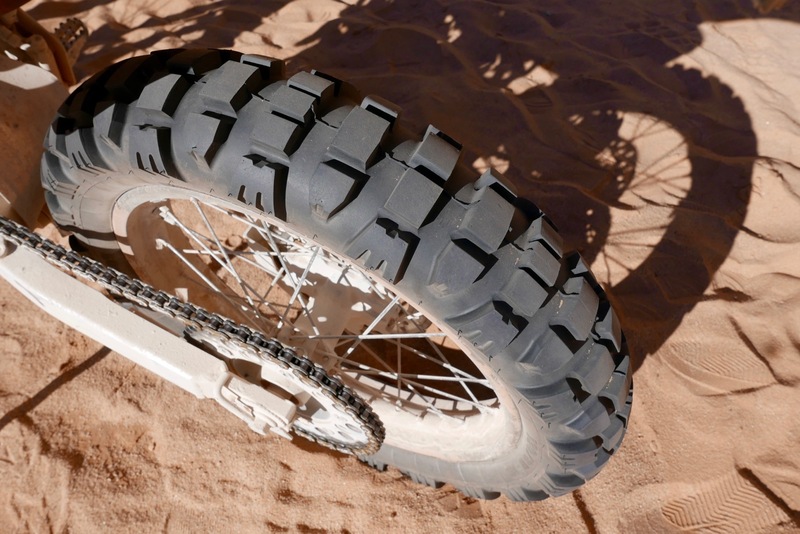 It’s certainly less tiring to ride the dirt with tyres like this. Traction is OK on a dry road where there’s usually plenty to spare anyway, but at the cost of smoothness, noise, braking and perhaps, getting the pegs down. Up to a point modern ABS systems compensate for a knobbly’s reduced traction on road, but that won’t stop you sliding off on a wet hairpin. 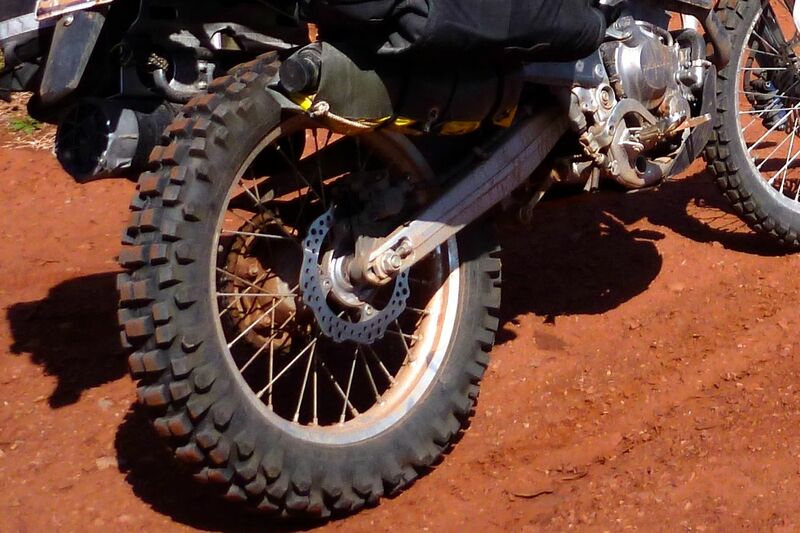 I’d designate most of these tyres as 50/50 road/dirt use; they do the job on the highway and work better than anything else on the dirt, including sand and mud. 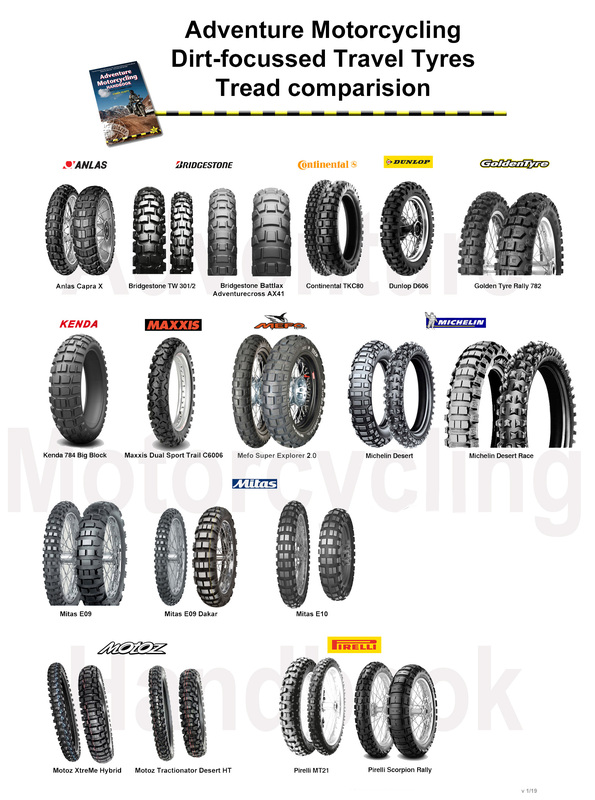 Tyres shown here left and right include Continental’s TKC 80 on the Tenere, a discontinued Michelin T63 on the fallen XRL, original Michelin Desert on the black Tenere, Pirelli MT21 Rallycross on the Funduro and which has around since the 1980s, Mitas MC23 Rockriders on the WR250 (left), a Mitas E09 on the XR400 below right. One time I spent the weekend in Wales with my WR on its original Bridgestone TW 301/2s (left) and expected the worst. Though they were at least eight years old they managed just fine in everything except perhaps wet grassy ruts. Not a single slide in 150 miles. And with a dense knob pattern they ought to last OK and made no noise that I could hear. 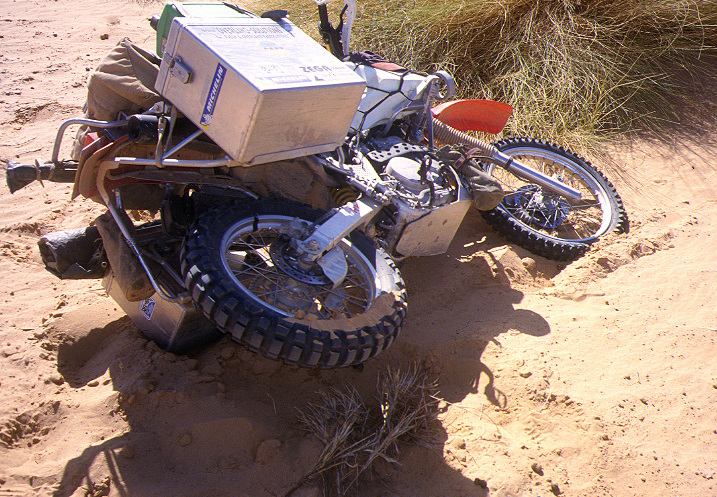 There are scores more examples of full-on, balls-out, off-road racing knobblies. 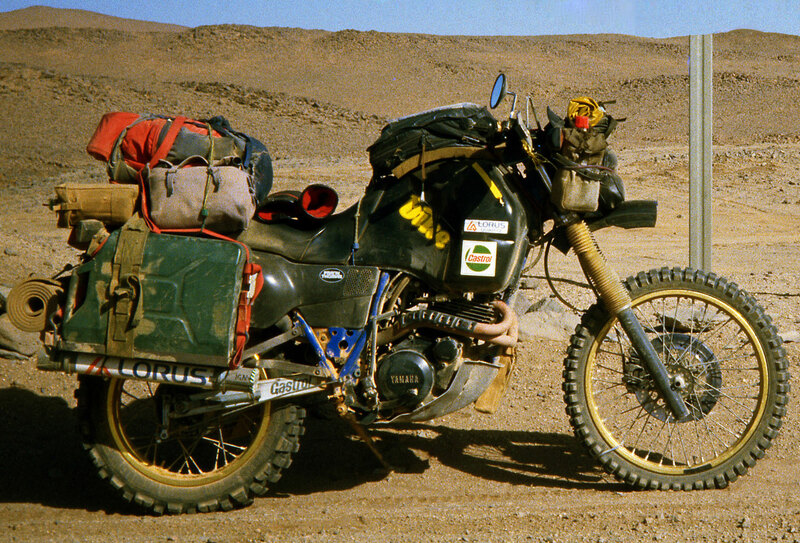 But on a big, loaded travel bike their aggressive tread patterns with tall, widely spaced knobs will wear very quickly on loaded edges, causing cupping to give a horrible ride on the road, as well as gripping poorly and squirming (knob-flexing) on road bends. Knobs may even break off at high speeds when a tyre gets hot. 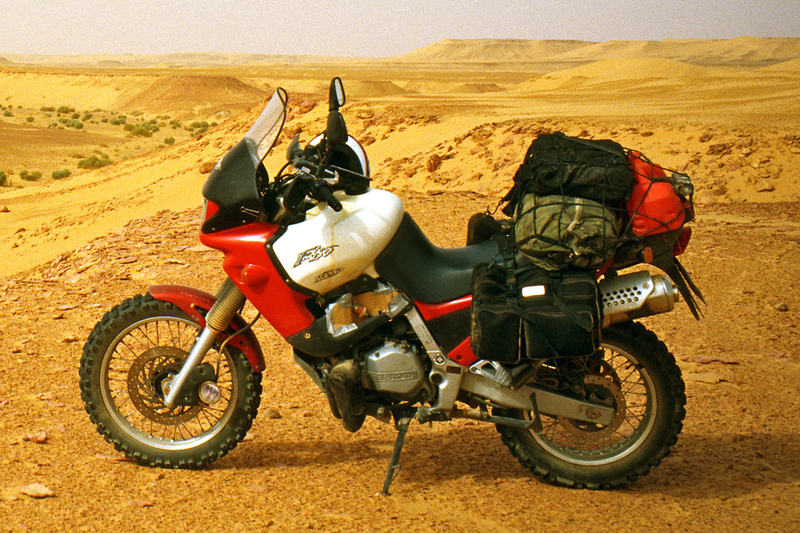 They can work on a light and low-powered bike like the CRF250L above left (Maxxis Desert) but Conti’s popular TKC80 as well as most of the tyres shown below have shallow knobs for just that reason. 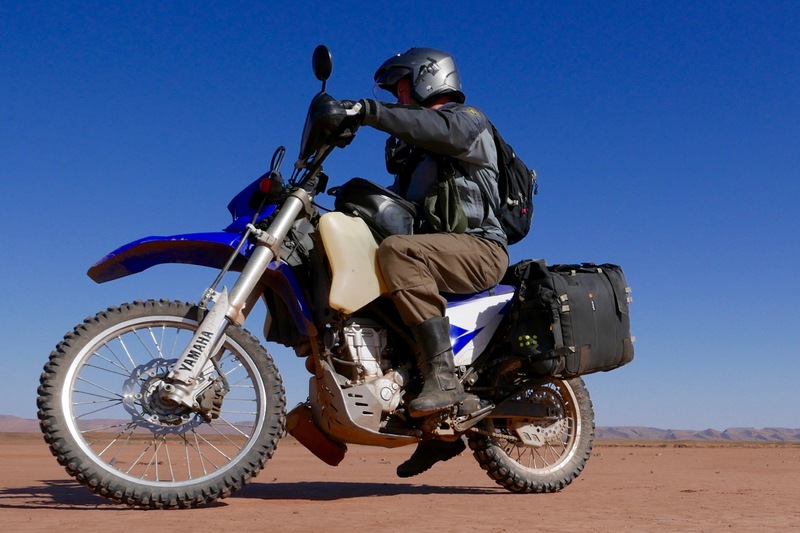 This entry was posted in Adventure Motorcycling Gear Reviews, AMH News, Tyres and tagged Adventure Motorcycling off road Tyres, Anlas Capra X, bridgestone AX41, Bridgestone TW302, Continental TKC80, Dunlop D606, Golden Tyre Rally 762, Kenda 784 Big Block, Maxxis Dual Sport C6006, Maxxis Super Explorer 2, Michelin desert, Michelin Desert Race, Mitas E09, Mitas E09 Dakar, Mitas E10, Mitas MC80, Motoz Tractionator Desert HT, Motoz Xtreme Hybrid, Pirelli MT21, Pirelli Scorpion Rally, road legal knobblies. Bookmark the permalink.